Having enjoyed Enigma’s Ward 13 and offered a generous discount to return to play another escape, we took advice from our host who suggested we try The Heist - the most difficult of Enigma’s rooms to date with a low 23.3% success rate. 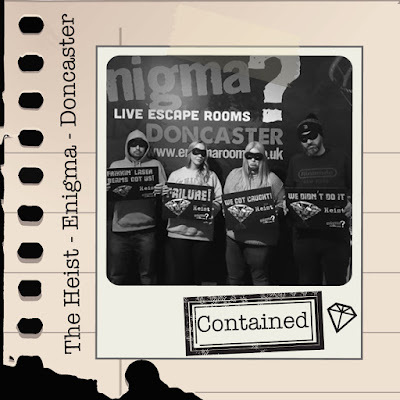 The plot was rather scarce: Us assuming the role of a team of cat burglars with eyes on the world famous Enigma diamond. There was no dramatic introduction or back-story from our host, nor any fancy video thickening the plot - a rarity, given the latter styles of introduction is what we’ve come to expect before entering other escape games we’ve played. The door locked shut without much instruction and our 60 minutes began. A positive was the theming of the room, the museum quality decor was to an extremely high standard. That being said the set up, with items encased behind displays, left little in the way of tangible artefacts or furniture to investigate - taking away from the hands-on interactivity we personally prefer. The number of exhibits in the room was almost too overwhelming. With many items and no indication where to begin, we quickly understood why the escape percentage here was so low. We did have help though, in the form of 3 clues obtained by ringing a bell at the back of the entry door. Clues would be sent via a TV in the room from our host who offered much needed assistance in order for us to progress further along in the game. The solving of puzzles, a majority of which were dependent on reading lengthy pieces of mostly irrelevant text, was not only frustratingly time consuming to read but rather laborious for a team of four. Often leaving players stood around without much to do whilst masses of script was read aloud. With nothing to examine in the meantime, this quickly became rather tedious. The technology here was impressive, although it’s also The Heist's achilles heel. Progressing forward in the game failed to revoke any sense of achievement due to the lack of tangible, traditional key or coded locks. Without those physical acknowledgements of our accomplishments it took away from the importance of our role and it's immersivity somewhat. The puzzles also didn’t seemingly have any sequential flow and went from one subject to another without any relevant association. Another gripe is that the torches we were given were irritatingly temperamental, with one giving up completely early on in our game. A preventable issue should these have been checked before we entered. Despite high exceptions from our earlier gratifying game in Ward 13, regrettably the only thing we left The Heist with was a unsatisfied sense of disappointment. This wasn’t due to being contained, as despite it’s faults we did well to get right to the very end. Cracking the final clue just seconds before our sixty minutes were up resulted in us running out of time to make our escape. Fortunately this wasn’t our first game with Enimga so we wouldn’t be put off returning to try other rooms at this venue. But sadly (in its current form at least) playing the role of cat burglars at The Heist just wasn’t for us.